The Estigia type series extends the KSB product portfolio for the chemical and petrochemical industries and other applications. 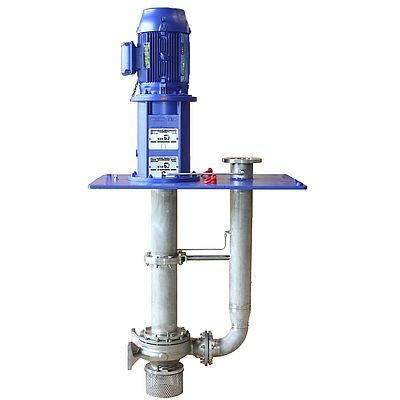 The low-pressure suspended pumps are designed for vertical wet installation in a closed tank under atmospheric pressure. For the installation depth, various lengths ranging from a minimum of 852 mm to a maximum of 6402 mm are available and three discharge pipe diameters can be selected for each pump size. Given the vertical design, the pumps only require very little space. When the immersion depth exceeds 2400 mm, a special design element between the support column sections and the discharge pipe makes for significantly reduced vibrations. The casing cover of the pump is fitted with a product-lubricated plain bearing made of high-grade, wear-resistant silicon carbide. This results in a long service life and long maintenance intervals. The pump set is easy to install and dismantle with its integrated cover plate serving as the tank cover. The material variants on offer are cast iron, stainless steel and duplex steel. Replaceable casing wear rings prevent possible wear on casing and impeller. The Estigia type series is characterised by a high efficiency and low operating costs. The pump set can be supplied with shaft bearings lubricated by the fluid handled, an external liquid or an electric grease pump. A so-called cantilever design is also available. This version is designed to ISO 5199, with flexible coupling and grease-lubricated rolling element bearings arranged outside the fluid handled. The pump is suitable for fluid temperatures of -30 °C to +100 °C. It can be driven by variable speed and fixed speed electric motors, with or without ATEX approval. Owing to its excellent insulating properties, sulphur hexafluoride or SF6 is primarily used in medium to high-voltage gas-insulated switchgears (GIS). As one of six greenhouse gases, it must not be released into the atmosphere. Netzsch's NEMO progressing cavity pumps are an alternative to air-operated diaphragm pumps. They offer greater cost-effectiveness through low energy demand, increased production capacity, better product protection through low-pulsation conveyance.